The SEC requires hedge funds and wealthy investors with over a certain portfolio size to file a report that shows their positions at the end of every quarter. Even though it isn’t the intention, these filings level the playing field for ordinary investors. The latest round of 13F filings discloses the funds’ positions on September 30. We at Insider Monkey have compiled an extensive database of more than 700 of those elite funds and prominent investors’ filings. In this article, we analyze how these elite funds and prominent investors traded Alexion Pharmaceuticals, Inc. (NASDAQ:ALXN) based on those filings. Alexion Pharmaceuticals, Inc. (NASDAQ:ALXN) was included in the portfolios of 42 funds from our database at the end of September. The company registered a decrease in hedge fund interest during the third quarter, as there had been 46 funds long Alexion at the end of the previous quarter. At the end of this article we will also compare ALXN to other stocks including O’Reilly Automotive Inc (NASDAQ:ORLY), Applied Materials, Inc. (NASDAQ:AMAT), and Prologis Inc (NYSE:PLD) to get a better sense of its popularity. 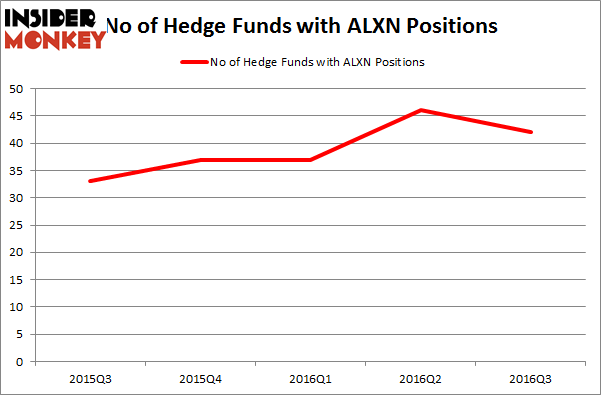 As stated earlier, heading into the fourth quarter, 42 funds followed by Insider Monkey were bullish on Alexion Pharmaceuticals, a decline of 9% from the previous quarter, after the stock soared to a yearly high in hedge fund ownership on June 30. With hedgies’ sentiment swirling, there exists a select group of noteworthy hedge fund managers who were upping their stakes meaningfully (or already accumulated large positions). When looking at the institutional investors followed by Insider Monkey, Baker Bros. Advisors, managed by Julian Baker and Felix Baker, holds the most valuable position in Alexion Pharmaceuticals, Inc. (NASDAQ:ALXN). Baker Bros. Advisors has a $801.8 million position in the stock, comprising 7.3% of its 13F portfolio. Coming in second is Samuel Isaly’s OrbiMed Advisors, with a $323.3 million position; the fund has 3.7% of its 13F portfolio invested in the stock. Some other professional money managers that are bullish comprise Israel Englander’s Millennium Management, Arthur B Cohen and Joseph Healey’s Healthcor Management LP, and Steve Cohen’s Point72 Asset Management.